Online streaming video systems have become extremely popular, yet navigating to target scenes of interest can be a challenge. While recent techniques have been introduced to enable real-time seeking, they break down for large videos, where scrubbing the timeline causes video frames to skip and flash too quickly to be comprehendible. We present Swifter, a new video scrubbing technique that displays a grid of pre-cached thumbnails during scrubbing actions. In a series of studies, we first investigate possible design variations of the Swifter technique, and the impact of those variations on its performance. 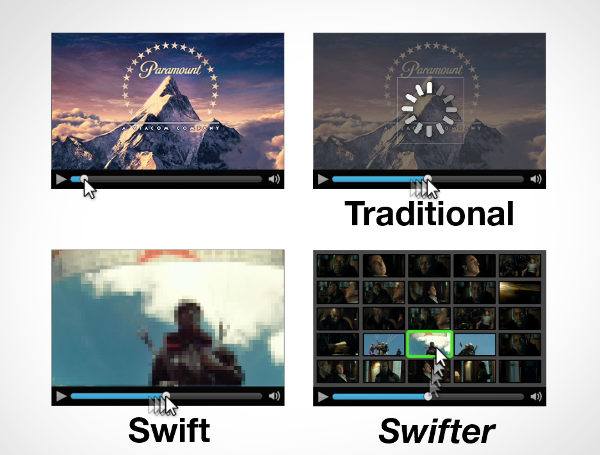 Guided by these results we compare an implementation of Swifter to the previously published Swift technique, in addition to the approaches utilized by YouTube and Netfilx. Our study finds that Swifter significantly outperforms each of these techniques in a scene locating task, by a factor of up to 48%. What is the latest in state of the art baseball analytics?